OSG Billing Services - Why OSG? A strategic partnership with OSG offers unrivaled industry experience, creativity and best-in-class service. The focus of OSG has always been on giving our customers the highest possible level of service. 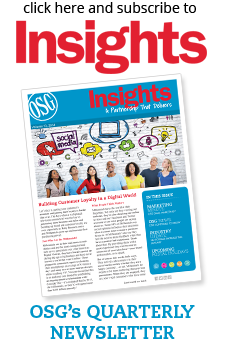 OSG has become an industry leader through our commitment to providing integrated and relevant customer communications across all media. At OSG, we are keenly aware that the invoice/statement package has the potential to become a revenue-producing resource. Utilized as a transpromotional document, an invoice or statement is a reliable method for maintaining constant communication with customers. While strengthening customer relationships, they also enhance a company’s image and build brand loyalty. To help our customers maximize the value of their invoices and statements, OSG has created an array of products and services that can be configured to meet your specific needs. Using our electronic or print and mail solutions in conjunction with our creative team’s expertise, allows our customers to make the most of their monthly customer communications. Whether electronic or print, OSG utilizes a highly-defined Automated Document Factory (ADF) system, which allows us to implement stringent quality controls for invoice and statement production. To ensure business continuity, we operate full production facilities in Birmingham, Alabama; Carlstadt, New Jersey; Carol Stream, Illinois; Council Bluffs, Iowa; Eagan, Minnesota; Jacksonville, Florida; Milwaukee, Wisconsin; Mount Airy, North Carolina; Naperville, Illinois; Renton, Washington and Tempe, Arizona. Invoice production takes place 24 hours a day, seven days a week, 365 days a year. A strategic partnership with OSG offers unrivaled industry experience, creativity and best-in-class service. Our mission is to guarantee that our customers’ critical communications are distributed on-time and error-free, and that they effectively promote their businesses and facilitate increased sales.